Given: Miami is a football school. To the extremes, usually. But so are 200 other Division I colleges. 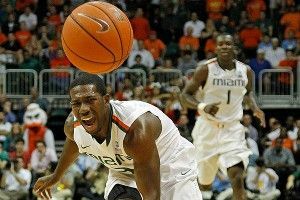 What distinguishes Miami is not the passion for football, but the utter absence of love for basketball. Earlier this season, the Hurricanes earned a huge victory when they beat Duke at Cameron Indoor Stadium in overtime. Going into Wednesday’s matchup against North Carolina, first-year coach Jim Larranaga, who inherited a talented team of upperclassmen from Frank Haith, had led the Hurricanes to a 15-8 record. His team kept getting better and better. Miami had won five of its last six. (The Hurricanes fell to no. 17 Florida State on Saturday.) An NCAA tournament berth was very much in play. And yet the fan support was abysmal. Average attendance for Miami home games last season was 4,763, the lowest in the ACC. True, the numbers are down across the conference, but as a rule you wouldn’t expect one of the top teams to have the lowest attendance. The situation hasn’t improved in 2012. The last home game, against Virginia Tech immediately after the Duke win, drew just 4,200. The game before that, a thrilling double-overtime win over Maryland, boasted 4,600. But then there was North Carolina. The Tar Heels, it should go without saying, are an elite program. Their home attendance is just fine, thanks, up from last season to almost 20,000 fans per game. Along with Duke, a team that sells out like clockwork due in part to reputation and in part to a relatively small venue (Cameron’s capacity: 9,314), the Heels are one of the few ACC teams without image anxiety. And, like most great teams, they tend to draw large crowds on the road. This was clearly a special game for Miami. Along with the team’s recent surge, led by a crop of upperclassmen including 6-foot-11 Kenny Kadji, 6-foot-10 rebounding machine Reggie Johnson, and guards Malcolm Grant and Durand Scott, the timing couldn’t have been better. Miami was peaking at just the right time. Larranaga understood the importance of this game — he and the team spent Monday canvassing the campus, handing out free food and asking (begging?) students to turn out in numbers to fill the 8,000-seat BankUnited Center. He even dispatched some Zen wisdom to his team, quoting Deepak Chopra before the game. He whipped the school into a frenzy. A good coach knows how to seize an opportunity. This wasn’t just about winning a basketball game. This was about creating a basketball environment in Coral Gables, about establishing a tenuous foothold in the athletic landscape. This was about hearts and minds. It worked — Miami had its largest crowd of the season on hand Wednesday night, 7,071 fans strong. This was a chance to capitalize on the momentum that could carry the Canes to the Dance. When Larranaga’s team went up 35-30 at halftime, the supporters understood that this was no pipe dream. Miami was good enough to beat Carolina, as it had been good enough to beat Duke. The unifying win was there to be seized. And then it vanished. North Carolina found its rhythm, crashing the offensive boards and creating second chances while Harrison Barnes dropped 14 points on the Canes. Miami had a terrible half — players dropped rebounds, dribbled off their feet, missed defensive assignments, committed back-breaking fouls, and relinquished the lead for good with nine minutes remaining. They got no help from the referees, and little help from the crowd, which plainly wasn’t used to boosting a floundering team with the power of a collective voice. When it was over, the Hurricanes had allowed Carolina to nab offensive boards on 52 percent of all shots. They turned it over 14 times for the game, including eight in the second half, failed to reach the line with any consistency, and finally suffered a 73-64 loss. Grant scored just three points. Johnson managed only two in the second half. Shane Larkin, the lightning-quick freshman who had disappointed Larranaga with his intensity in recent practices, played just 11 minutes. Even on TV, you could hear the crowd give up. Seven thousand strong or not, this wasn’t the game they’d hoped to see. That kind of numerical support, taken for granted in so many corners of the college basketball world, is a rare and precious thing at Miami. Larranaga knew it, and so did his team. But it was squandered Wednesday night in a half that can only be called embarrassing. With the tournament outlook uncertain at best, it’s anyone’s guess when they’ll have another chance. Larranaga was asked about the missed opportunity, of course, and of course he wasn’t biting: “Anytime you lose, it’s a missed opportunity,” he said. You can just imagine Miami’s PR person patting him on the head. But this one wasn’t like the others, and Larranaga knew it. Miami’s schedule is favorable over the last five games, and the North Carolina loss won’t break its tournament hopes. But when it comes to the atmosphere in Coral Gables — those pesky hearts and minds — it’s back to square one.